Design your own white t-shirt in 3 simple steps. Customise it with your own message or images. You have the option to collect your order in-store, or have it delivered to your door. 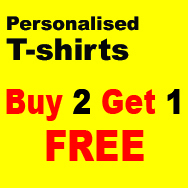 Single Sided White T-Shirts are now 3 for the price of 2 until 31st December 2016. We will call/email you to confirm the required sizes before printing.